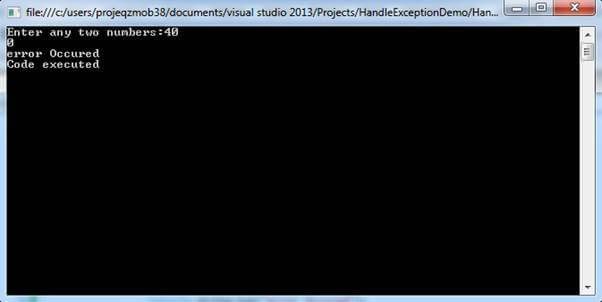 In this tutorial, you'll learn about the various methods of handling exceptions in your code, and how to various methods of implementation to fix these errors. What are the types of errors occurring in .NET? Program to handle an exception, using Logical Implementation. Program to handle an exception, using Try-Catch Implementation. Top 10 Interview questions on Exception Handling Mechanism. This error will occur by typing the wrong syntax like missing double quotes, terminators, etc. We as a programmer can identify these minor errors and easily rectify them. This error occurs when the program is compiled, and the errors, like assigning wrong data to a variable, creating an object for the interface, etc., occur. This error can be identified and rectified before the execution of the program. This error will occur at the time of executing the program. Some typical errors are: entering the wrong data into a variable; and trying to open a file for which there are no permissions, which are trying to connect with the database with the wrong credentials. A runtime error is known as an exception, as it will cause abnormal termination of the program execution. To avoid abnormal termination of the program execution, we need to handle the exceptions. In this method, we handle the exception by using logical statements. In real time environments, the first and foremost importance should be given to logical implementation only. If it's not possible to handle any of the exceptions using logical implementation, then we use try catch implementation. When the user enters the second number as zero, an exception will be raised. This is handling, using logical implementation. A try block can be followed by any number of catch blocks, where writing final blocks is optional. If a catch block is used without an exception class, it is known as a Generic Catch block. If catch block is used with an exception class, it is known as a Specific Catch block. This block contains all the statements in which there is a possibility of an exception occurrence. This block contains all the statements to handle the exception, which is raised within the try block. The execution starts from the try block, if there is any exception which occurs in any statement of the try block, then the lines of exception statement given below are ignored and control jumps to the catch block. Subsequently, the catch block is executed and then the final block. It's simple. 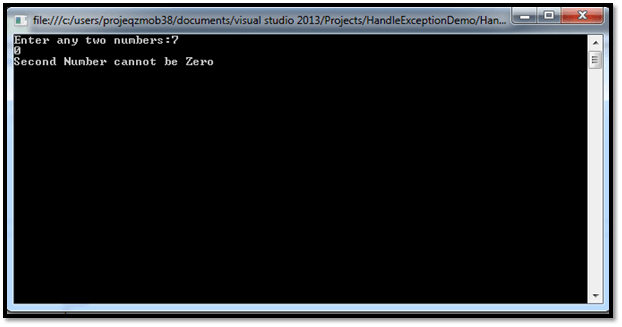 Let’s see a sample program to handle an exception, using Try-Catch implementation. What are the different types of errors which occur during program development and execution? Explain Try-Catch Implementation and Nested Try-Catch Implementation. What are the properties of the Exception Classes? What is the process of an Exception? I hope this article helps you gain knowledge on an exception handling mechanism in .NET. Thanks for reading and let me know your valuable comments. Published at DZone with permission of Rathrola Prem Kumar . See the original article here.